Your vehicle’s braking system is its most important safety component. Nothing is more important than your vehicle’s ability to stop on a dime or slow down safely in traffic. 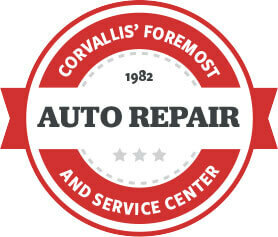 London’s Automotive in Corvallis, OR is this area’s preferred destination for quality automotive repair. Complete brake checks, brake maintenance, and brake repair service is our specialty. Pay attention to your brakes’ performance and listen for any warning signs. The first warning sign that most driver hear is the high-pitched squeal when you press the brake pedal. This sound is your vehicle “telling” you that it’s time to visit London’s Automotive. Our brake service experts provide a quick but thorough brake inspection to find out the true condition of your brakes. We can perform quality brake repairs for any of your braking system parts. Brake pad replacements are an expected repair service that every vehicle will need eventually. London’s Automotive is experienced at performing brake services for all makes and models of vehicles. Delaying a brake repair service can do extensive damage to your braking system’s parts. After the brake pads have worn through to the soft metal underneath, you’ll hear the high-pitched squeal. This noise will soon turn into a scraping or grinding sound whenever you press the brakes. You should bring your vehicle to our shop as soon as possible because this is an emergency that compromises your safety. Waiting too long may damage the brake rotors as the metal calipers press worn brake pads against the rotors. All rotors will need to be replaced after approximately 70,000 miles but this causes an unnecessary early replacement. Act fast when you have a brake performance problem. All you have to do is pay attention to the warning signs and give us a call. We’ll take care of the rest. We can get you back to safe road travel in no time. Using the latest technologies and service equipment for your specific make ensures that you receive the best quality brake service. Changing brake pads and brake rotors are the most common brake repairs. Good timing is how drivers keep their braking system in prime condition. The sooner you get to London’s Automotive, the sooner we can provide our top quality brake services. It all starts with your trust in us and our diagnostic equipment, and we’ll make sure your braking system is keeping you and your fellow passengers safe. Give us a call today at 541-753-4444 to schedule your next brake service appointment. Save time by scheduling right now using our convenient online scheduling system. Next time you’re in the area, feel free to stop by. We gladly accept all of our walk-ins!